Royal Enfield is growing exponentially in India. The company operates two manufacturing facilities in India. Royal Enfield has announced that they have started the production at a third facility in Vallam Vadagal near Chennai in Tamil Nadu. The new facility is spread over 50 acres and will add to the Royal Enfield’s domestic and international market supply. The new plant has an annual production capacity of 300,000 motorcycle units per annum in the first phase. The output can increase in the later stages if the demand increases in the future. 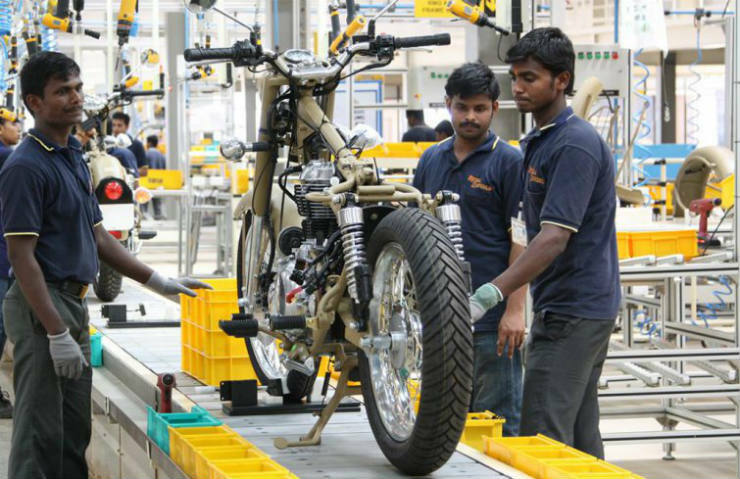 In the current calendar year, Royal Enfield has a total production output of 825,000 units per year. The motorcycles are both for the Indian market and for the international market. Last year, Royal Enfield produced and sold 667,135 motorcycle, which is almost equal to the full installed capacity of the manufacturer in India from the existing two plants. Royal Enfield completed the construction of the new facility in Vallam Vadagal in a record 15 months time. The company bought the land in October 2014. Royal Enfield says that the new plant will help the manufacturer to meet the rising demand for the motorcycle from India and around the world. Royal Enfield plans to pump in Rs. 800 crore to increase the capacity at Vallam Vadagal and also new platforms and products. The brand is also investing in the technical centers situated at Leicester, UK, and Chennai, India. Currently, all the Royal Enfield motorcycles come with long waiting period due to high demand. The new production facility will help to reduce the burden and will bring down the waiting period of the motorcycles. Royal Enfield is also planning to launch new products in the market that will enable to enter the higher capacity motorcycle segments and compete with the likes of Harley-Davidson in the market.